I know I was right in the middle of sharing the saga of making a wedding cake…but then I remembered what time of year it is. That’s right. Thanksgiving is coming. And during the weeks leading up to Thanksgiving, I like to focus on delicious side dishes and breads and pies…because let’s face it: vegetarians often get short shrift on Thanksgiving. When the big day is all about a big bird, and half of your relatives can’t live without bacon in their stuffing, sometimes the bountiful table in front of you doesn’t quite translate into a feast. Because Thanksgiving is fast approaching, and I, like many of you, am scouring recipes and cookbooks for the perfect things to bring to the table, I definitely want to share some easy meatless side dishes with you! That way, on Thanksgiving, no matter what your palate prefers, you can do what my family always does: LOAD UP. As a vegetarian, I often miss out on foods that other people rave about. Sometimes there is an easy substitution, like a delicious veggie burger. 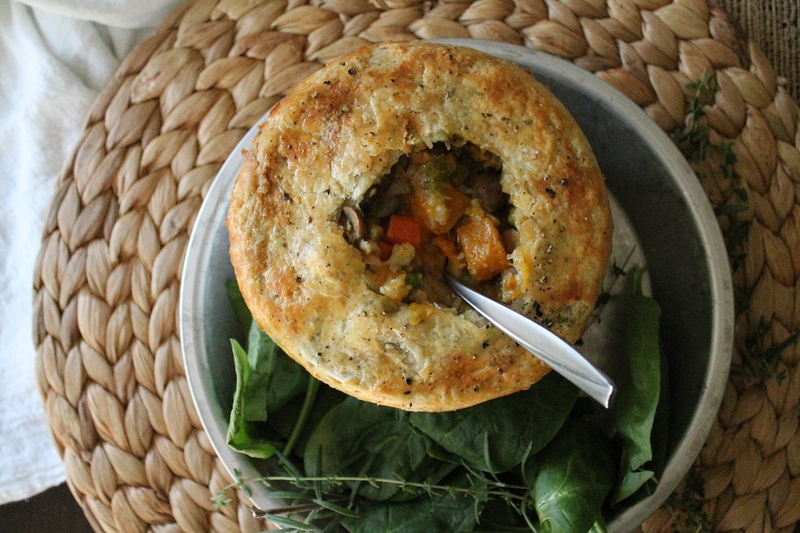 But sometimes, as with pot pies, I more often find that vegetarian versions are disappointing or weird than satisfying and comforting. No doubt, to turn a meaty classic into a delicious vegetarian dish can be a challenge! It usually requires about a thousand more ingredients and a lot of extra time. Building a balanced flavor that is as hearty and satisfying to a carnivore as to a vegetarian is involved! Part of this is definitely personal prejudice on my part. I’m sorry, but a potato is a starch! And, to be honest…peas are pretty darn close to a starch. So if those are the only “vegetables” in an already creamy and crusty pie, you’ve kind of lost me. If I am going to spend hours making crust and stirring fillings and then baking a pie, I want to be eating something absolutely stuffed with a rainbow of vegetables (and therefore nutrients), as thanks for my trouble! Cue this pot pie, full of hearty Fall vegetables: butternut squash, carrots, brussels sprouts, and cauliflower are all at their best and brightest in the cool months! 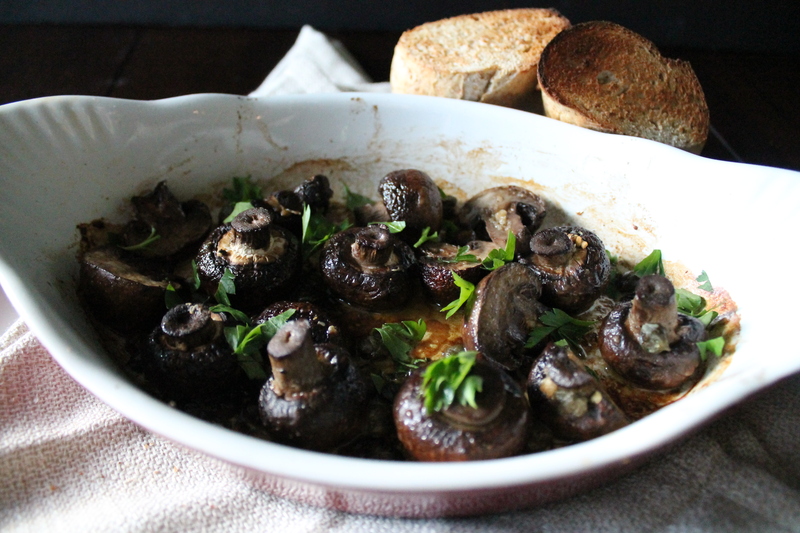 Add some browned mushrooms and onions for a nice, savory base, plus the most deliciously herby and peppery crust, and I honestly think you couldn’t ask for anything more! So last time, I shared the inception of this wedding cake with you. 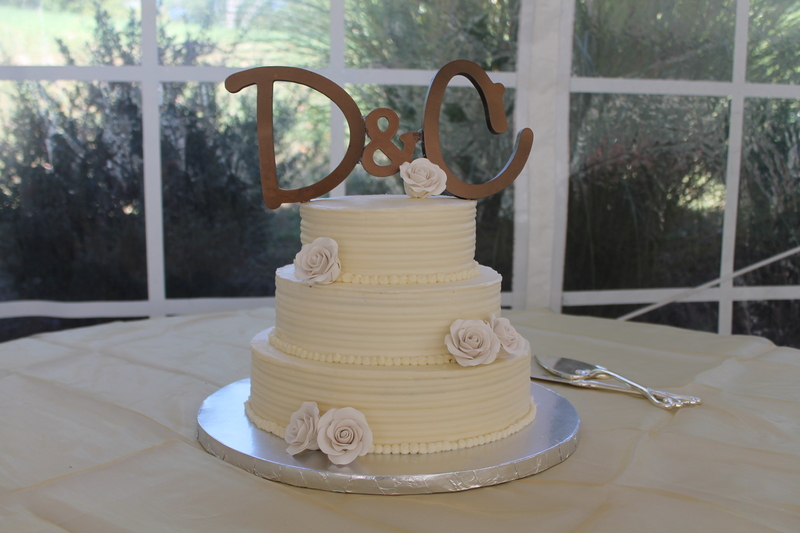 To recap: the bride and groom requested a 3-tier cake, each tier consisting of pumpkin spice cake, a thin cheesecake filling, and Baileys cream cheese frosting on the outside. It’s a tall order! Not only is a wedding cake a nerve-wracking, complex thing to take on, but I embraced the additional step of baking cheesecakes to fill the layers, rather than filling with a simple frosting or ganache. Have you ever make a cheesecake-filled cake? It actually isn’t as hard as it sounds, but it does require extra time and a mountain of extra dishes. 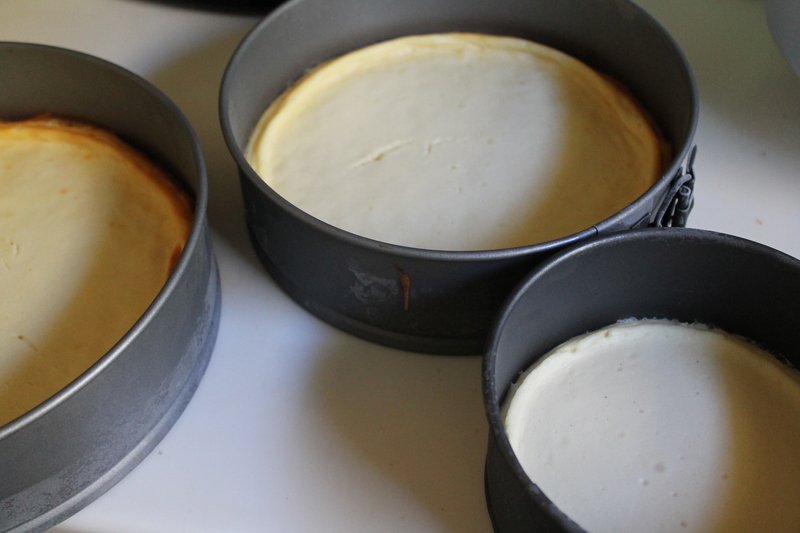 The cheesecakes are typically baked in advance and then frozen, which makes them firm enough to handle without crumbling or smushing during assembly. I may have been somewhat MIA over the last several weeks, but I promise I have not been idle. I have been hard at work on a wedding cake for a good friend of ours! When the idea first came around, it was almost a joke. You see, I have a frustrating tendency to volunteer for everything. And even to make up events so I can then volunteer to do everything. It’s a sickness. 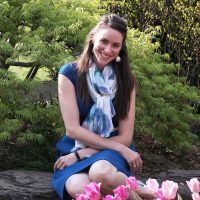 And months of planning later…here I am!